Coimbatore – Palakkad – 50 Kms. Cochin – Palakkad – 120 Kms. Calicut – Palakkad -140 Kms. 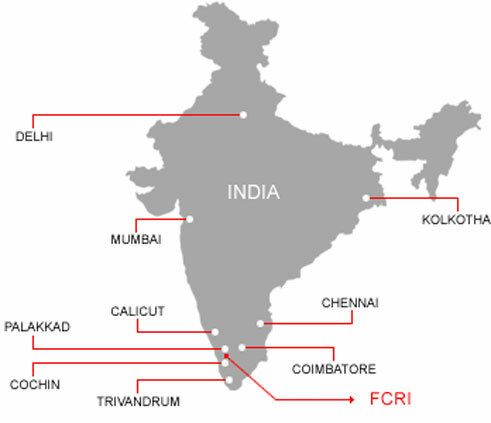 FCRI is at Palakkad, a town located in the Southern part of the Indian Peninsula (Kerala State). The nearest domestic airport is at Coimbatore which is 50 Km from Palakkad town. It is well connected to the international Airports of Madras (Chennai), Bombay (Mumbai) and Delhi. Tropical climate conditions prevail in this area. During the period from January to March weather will be pleasant with average day temperature about 28oC and the night temperature about 22oC. April to June average day temperature will be about 34oC and night temperature about 24oC with monsoon rains. September to December weather will be pleasant with average day temperature about 26oC and night temperature about 22oC.